Farm Life Love | Life, how did we get here? Life’s about choices. As we have advanced as a culture, we have created more choices in nearly every aspect of life. When I was planning my wedding, I remember being in awe about all of these choices being thrown at me. Sometimes it felt like I was on the bottom of a big pile just trying to get out from under it one decision at a time. Some people thrive in that situation. For me, I just wanted to marry my husband and not worry about whether we’d have wine on each table or serve it from the bar. That’s not to say that choices are not important. Certainly there are those that are indeed more important than others – like my decision to say “yes” to my husband when he asked me. Or even perhaps my choice to ask him, had I thought of that. To me, this ongoing debate about how farmers should farm is much like this type of scenario. There are many choices we have to make – like what color or brand of equipment we choose, which isn’t as important as whether we will be buying a no-till corn planter or something else that makes sense for our farm. As I’ve been vocal in the debate about labeling or as I see it, stigmatizing, food produced with GMO crops, people have asked why speak up? Reporters seem to always want a simple answer – which happened in this Christian Science Monitor article, which I was happy to be a part of but left me a bit disappointed in its finished form. The journalist reasoned that my main concern about stigmatizing GMOs was because I was afraid it would raise the feed expense for the cows and thus, my boys wouldn’t have the chance to carry on our farming tradition. While this is a small part of my concern, there’s way more to it. Let’s face it. Right around one percent of Americans are primary farm operators, or about one farmer for every 99 people. One expert and 99 back seat drivers give or take. That’s a pretty big bus that farmer’s driving. To some extent, the farmer can listen to passengers and go slower or faster, turn the A/C or heat on or off, provide more cushion on the seats or not; but at some point, the bus has to safely arrive at it’s destination – avoiding pot holes, ice, ditches, oncoming traffic, etc. More importantly, the driver (the farmer) has to make the best decision possible for protecting those passengers, getting them safely from here to there while keeping the bus in good condition for future trips. Sure, there may be other buses passengers can choose – but there won’t be as many without preserving options – either through legislation or the market. Back to choices as a farmer and figuring out the best way to make the best use of our resources while preserving the farm for the next farmer to come along: Choices ensure sustainability. We face a constantly changing landscape as farmers, with new challenges and opportunities appearing nearly every day. No doubt my sons, or the next farmers here, will face the same. In order to keep up, adjust or take advantage, the ability to make choices that the market will accept and that regulation will not deny will be key to ensuring sustainability. So yes, preserving the next generation’s chance to farm is about concern for the cost of feed for the cows – both economically and environmentally, but it’s also about so much more than that. A few months back I was lucky enough to attend a conference put on by The Economist Events called the Innovation Forum. Yes, the magazine The Economist. I was there with the incredible honor of representing the Innovation Center for U.S. Dairy. You may wonder why something so traditional such as the dairy industry was present at this conference, well I’ll get to that in a minute, but first: sustainability. To me, sustainability is a three-legged stool, a milking stool, if you will. One leg is environmental, one is social, and the third is economic. To be sustainable and ensure a going concern for future generations, you need all three legs in tact. I’ve recently touched upon economic sustainability; here we’ll talk environment and economic to some degree. I saw this tweet the other day, which rewarded me for my procrastination with this post. The story of how the dairy industry has improved its environmental impact over the past several decades is inspiring. Unfortunately, many are unaware of the steps taken by dairy farmers to reduce, reuse, and recycle. Jeff Simmons is President of Elanco. Some dairy farmers go above and beyond the rest of us. Yankee ingenuity was born on a farm, and it’s still alive and well today on a place located in the northwest corner of Connecticut, the Freund’s dairy farm and Cow Pots. A CowPot is a biodegradable nutrient-rich planter that is made from cow manure, after it has been run through a methane digester. Recently, the Freunds were awarded with a Sustainability Award from the Innovation Center for U.S. Dairy to recognize their innovative efforts in this area. How did the idea of CowPots come about? 1. 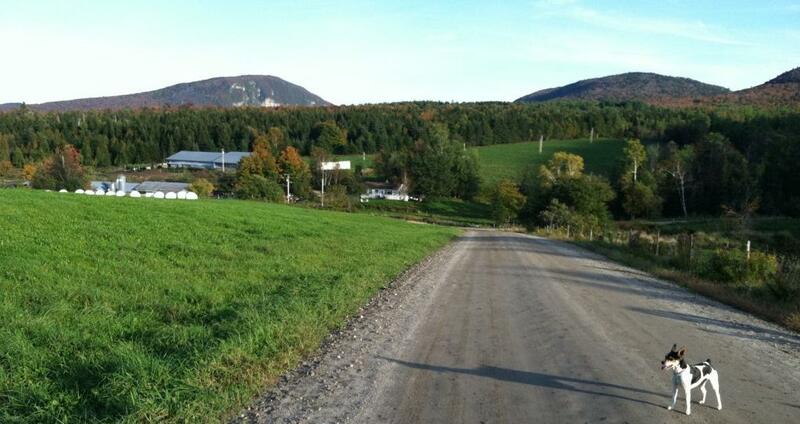 Our farming family collaborated with neighbor farmers to develop the Canaan Valley Agricultural Cooperative. The farmer members meet annually with the specific purpose of working and brainstorming together to manage the manure collectively produced on our farms. Amongst the farmers that attend, there are over 4000 cows represented, which equates to a lot of manure! These cooperative gatherings also include agents and professionals from CT Department of Agriculture, CT Department of Energy and Environmental Protection, UConn Extension, USDA Farm Service Agency and Natural Resource Conservation Service. Using this network of people and services has been critical from the very beginning of introducing the idea to developing and branding the end product. 2. Thinking of manure as a resource and not as a waste product. Changing our mindset about how we think of poo (or other byproducts) is a big deal. The reality is that there is a lot of fertilizer value in manure and it holds a great value for producing food. It stopped being a discussion about waste management and became a conversation about resource stewardship. 3. Perseverance. Ten years of trial and error, research and development, failures and successes took place before a viable product was developed and ready for market. During that time there were a lot of dead ends and bumps in the road, but my family carried on and didn’t stop until they proved there was a way to turn manure from poo to pot. How does it fit into your overall goals for the farm? The technical way that CowPots fits our overall goals is that it allows us to export 10% of the manure produced on our farm to places where those nutrients can benefit someone else’s garden. We ship boxes and pallets of this value added product to greenhouses and retail stores all over the country (and Canada). This is an important farm activity to comply with our Nutrient Management Plan, which is a contract between our farm and the USDA on how we manage the manure produced by our cows. From an outreach standpoint, marketing CowPots has provided us an awesome opportunity to talk to all sorts of groups around the country (and world) about our farm. We hosted Mike Rowe in 2006 to film an episode of Dirty Jobs, which has aired in over 120 countries. We’ve spoken at conferences in Seattle, St Louis, Washington DC, Worcester and many other cities describing the environmental and horticultural benefits of our products. Inevitably, these conversations also allow us to talk about the 2 most important components of our business; our cows and our family. Without these things, there would be no CowPots. What was it like winning the dairy innovation award- were there any particular moments or otherwise that stood out for you? It was a team effort to draft our application for the Dairy Sustainability Award; I think we had 4 or 5 family members that contributed to the effort. It was very special to be able to share the honor with the whole family. As the dairy farmer’s daughter, I was proud to see my dad and uncle be recognized for their unwavering commitment to being good stewards of the land. It was an honor to share the stage with my dad to receive the award and it sets the bar quite high as I think ahead to the positive impact my generation can make on this land and this community. What else is on the horizon for the farm? In March of this year we introduced our cows to a brand new barn with rotating brushes for back scratches, waterbeds for improved comfort, alley scrapers to keep the alley ways clean, a robotic feed pusher to ensure they have access to fresh feed 24 hours/day and most significantly, 5 robotic milking machines. We’re excited to be the first farm in the state of Connecticut to install this technology. This allows our cows to voluntarily choose when and how often they want to be milked. We’re still in the transition phase, but they’ve adapted to the new routine very well! And while there was a learning curve to accessing the robot milker, they didn’t need any training to figure out the back scratchers! As for CowPots, we’re experimenting with some new recipes and styles as we consider developing products that can be used outside of horticulture. We’re looking into the opportunities for manufacturing packaging corners and other products using our cows’ manure. There are an infinite number of products that we could form using our manufacturing process; plantable pots are just the tip of the iceberg. Well done, Amanda. My best to you and your family. I’m not a big one for New Year’s resolutions. I think you can and should start resolutions any time the need or desire arises. However, that said, I do take this time of year to reflect on the past twelve months and in the next week or so will sit down with my DF, my partner in life and on the farm, to look ahead and brainstorm some goals, expectations and plans. I will admit that I am somewhat glad to be moving on from 2015. It wasn’t a bad year, (I’d probably never admit it if there was one) but it had its moments. From not getting many Jersey heifers, to a tough year for crops and equipment breakdowns, to dropping milk prices, to finding balance with a new off-farm job and raising two budding independent farm boys, to juggling care for a family member in need. The year 2015 filled our plates and then some. Spring and early summer brought cropping challenges to the farm. While early on, with parts ordered well ahead of time and work completed and ready for a window of good weather in May, we encountered a breakdown right off the bat. And then another, and another and another. The entire month of June felt like it dragged on while we dealt with the repairs and waited through rainy weather. The highlight was when my DF drove our big tractor in reverse (it was stuck in gear) through town to get it to the mechanic. Boy I wish I got a picture! Shortly after the backwards tractor incident, we accepted the fact that “it is what it is.” That is, we are doing the best we can and will make adjustments along the way. For example we feed a “total mixed ration” or “TMR” throughout the year. By not putting up the highest quality feed we would have preferred to, we will be working with our nutritionist to come up with a balanced diet utilizing other feedstuffs to create the best feed for our cows, and it might cost us a little more. But that’s okay. It happens. I also had a tough year with my Jerseys. I unfortunately had to say goodbye to several – including a few that carried my high hopes. You see the girls have to in a sense, pay for their way to stay as we only have a certain amount of space. There were a couple who we had to sell because they were not coming back into calf for us, and since our farm relies upon their ability to produce milk and reproduce offspring, they couldn’t stay. There was also an old girl who went far back with me, pre-marriage and kid days, whose time had come. And there was an awful tragedy at the end of May: losing my best cow. In the past I would have written about a loss like that but for some reason this time I just couldn’t. I was incredibly sad for days. I tear up a little now even thinking about it. This was supposed to be her year – in her prime, looking great after freshening (having her baby). I felt a little hollow, like a little piece of me gave up a little at the time, but you know what, there are 103 other cattle here who need me, need us, just as much. And besides, I’d written about losing calves and cows before and didn’t want to seem like that’s all I write about. But maybe, like songs, the prettiest stories are somehow the saddest ones. In addition to the girls we had to say goodbye to this year, I also had a “run of bulls.” While we raise many of our bull calves now either for Jersey beef or for polled service sires, there’s still something special about getting heifer calves. They are the future of the dairy. They carry in them potential, and the promise of what is to come. Since January I have only had three heifer calves born out of 17 calvings. On top of that, two out of the three were by polled bulls and only one was polled. The other heifer, “Lady,” who has horns, was by a polled dam (mother) and a polled sire (father). Ready for a lesson in genetics? The polled gene is actually a dominant trait which means if it shows up, your offspring will be polled. So, with two heterozygous parents, I had a 75% chance of the calf being polled and at that, a 25% chance of it being homozygous polled. Homozygous polled would guarantee polled offspring for the next generation from that calf. Instead, I ended up with the 25% chance of the calf being horned! Fit right in with the way my luck had been going. Despite the bad luck with getting Jersey heifers, we had an awesome year for Holsteins with a 67% heifer rate. Overall, we were at 52% for heifer calves, which is slightly better than expectations, so no complaints there. Geez, this post is starting to feel a little whiny to me. Nobody likes whiners, including me. Perhaps this is why I didn’t write so much this past year. Perhaps I should use it as a reflection point because, of course, there were wonderful things to happen in 2015 as well. We are all healthy and happy, embarking on new adventures, facing challenges and cherishing every day with our farm boys and time with our families. We are blessed and feel responsibility to live up to our good fortune and do our best by it. Here’s looking forward to a new year and a clean slate. Cheers! Just saw that phrase online somewhere, and could not resist. People sometimes ask how I got interested in agriculture. What follows is the very beginning of my farm story. Some days I’m still amazed that I live on a farm. Being a farmer was a dream as a little girl, along with being a vet, college professor and a UN ambassador, but somehow the farmer one stuck. 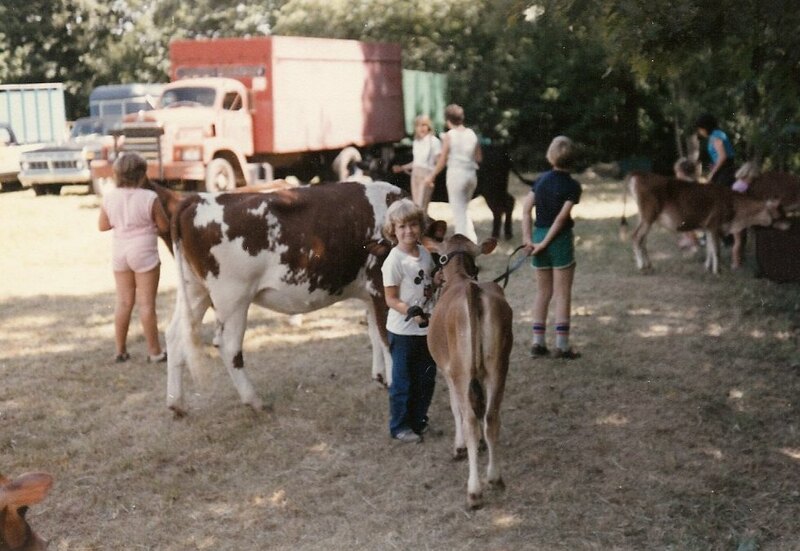 I started my path in agriculture with my family and my own 4-H dairy project, though we never lived on a farm. The cows enjoying a late summer day with Wheeler Mountain in the background. Retired now, my dad is a United Methodist minister and my mom is a nurse. We moved around a little while my dad served his calling, but always found a place to keep our cattle where we could help with farm chores – mostly daily, although at couple of times the cows were a distance away from us. It all started when my dad was serving a church in Spencer, Mass. At the time Spencer was still a fairly prominent farming community with several dairy farms in operation. One of the local farming families were members of the church and the farmer’s wife was an Extension Agent. She kept an acre of land and invited people who didn’t have a spot of their own to come to the farm and grow things in her garden. My mom, who was a city girl, reluctantly decided to give it a try, and brought my older siblings along with her. The farm is a quintessential New England farm. Set in a rolling pastoral scene, the place dates back to a time where Indians were a big concern – there is even a small hiding spot next to the main fireplace in the farmhouse for hiding if a raiding party was known to be in the area. They milked Jersey cows, which is where my love for Jerseys comes from. I can even remember two old girls, one whose name was Venus, they retired but kept and lived to the ripe old ages of 19 and 21. My mom kept her spot in the garden for several years and learned a lot not only about growing things, but about the rest of the farm too. My parents even helped when they could – whether it was doing hay, other chores or helping with the cows and calves. At some point, the farming couple’s grandchildren who were close in age to my older brother and sister started getting their 4-H calves ready for the local fairs. My sister and brother wanted to be a part of the fun too. Despite my parent’s explanation about not living on a farm and not having our own place to keep cattle my siblings wouldn’t give up hope for their own 4-H calves. Mom recalls with specific detail the look of disappointment on my older brother’s face when they revealed a Silver Fox bicycle instead of a little brown calf on his birthday one year. I’m not sure if either of my folks can pinpoint the exact day or instance when they thought maybe they could figure out how to keep a couple of calves. My mom will tell you she learned that you shouldn’t get in the way of God’s plan. Regardless, soon after my brother and sister started 4-H with their calves, Katrina and Rainbow, and the rest is history. One of my big days in a kiddie class. Being the tag along little sister, I COULD NOT WAIT to get my own calf. I tried to brush their calves, lead them in the kiddie classes at local county fairs or go with them to the farm while they took care of their animals. I’m sure I was a pain and got in the way a lot, but I don’t remember caring. Finally, when I was nine as of January 1, we went to pick out my first calf. Of course I fell in love with the first one I laid my eyes on. Her name was Annabelle, and she was the sweetest, prettiest calf I ever saw. Unfortunately, as far as calves go, Annabelle was really a bit on the ugly side and she contracted coccidiosis sometime along the way, which stunted her growth. I was only able to keep her two years but then got my second calf – Ivory. Suffice to say I didn’t have great luck with my first two calves. It wasn’t until I bought a calf from my older brother that my luck started to turn around. Her name was Koral, who was a descendent of his first cow Katrina and we still have family members in our herd today. So that’s how I got started in farming. Some days I still can’t believe I’m living out my childhood dream of being a farmer, married to a farmer, raising my kids on a farm and holding on to these Jerseys that came into my life so very many years ago. Of course, there’s lots that has happened between then and now. But I’ll save some of that for another post.